39 Comments on "Ruins of Ancient City Discovered in Australian Desert"
Jake – If you can’t spell Ian, you’re the idiot! Why be abusive to make your point? Just because you have a different opinion doesn’t make you right. Ian basically your right – as the Aborigines speak of peoples being here before them. Australia use to be known as MU before the Flood of Noah. Maybe it proves that other cultures came to this country & chose to live in harmony rather than coming in to massacre the Indigenous people of this land…perhaps they died out because the environment was too harsh for them…& the Indigenous people survived because they actually belong to this land like we already know. Aboriginal tribes up the top end of the Northern Territory had peaceful trading relationships with islanders from other countries for centuries or more before Captain Cook and his mob imposed. Read ‘Why Warriors Lay Down and Die’ if you want to learn more; it should be mandatory in Australian schools so that everyone can understand better what the Aboriginal people have gone through and why they are still so badly affected today. It took the ancestors of Aboriginal people about 15,000 years to slowly migrate from Ethiopia to Australia. There were several waves of migration. The term “aborigine” doesn’t just extend to Australians. It refers to indigenous people all over the world, namely the very first people to populate it. Since then, they’ve been invaded by successive migrations. Australian Aborigines were among the last suffer such a wave. There were language groups in this region for thousands of years before the dig area was supposedly populated. If it is an actual site, then I’m surprised something of this size wasn’t recollected through local and networked oral lines. There is a very reasonable possibility infrastructure like this can exist within that climate, where those people came from is another question. In addition it’s reasonable to suggest hominoid relatives lived in the area long before human existence. In relation to the term Aborigine, they were an actual group of people. The association to inhabitant of the land came later, check your etymology. Further to that check your local first nations language, maybe there’s something to learn. Australia and Lamar (MU) were separate continents, MU was in the middle of the Pacific Ocean. That’s just incredible! I thought the climate in central Australia had been arid for over 30,000 years. 30000 people living in the desert? That would require agriculture and irrigation. There are no flowing rivers to irrigate from, and there weren’t 500 years ago, but maybe 1500 years ago, who knows? Also it is about 2000km from Uluru to the northern coast. For it to be a major international trading centre, it would actually need a port. In a land where there is no evidence of domestication of animals to pull carts, or even the very existence of wheeled carts … well that’s a bloody long way to carry your wares. That must have taken some major organization. 470ad was a little more than 500 years ago…. And if you go to Uluru you can find shells on the ground….. that means it was once under water…. I dont agree with your argument – as Australia once was had an inland sea ( though very shallow ) and was a great ring island according to Aboriginal legend. That water became the artisan basin when Australia rose up in times past from earth changes. The Aboriginals use to go across the sea in their canoes to Ayres Rock and use it as a look out in the centre of the waters. Additional to this we know the Chinese built pyramids which have been found in WA and introduced the Dingo ( not native to Australia but China ). As well, Egyptian artifacts and boats with hieroglyphs have been unearthed in the Hunter valley in NSW. Australia in pre-deluvian times was known as MU and had many civilizations dwelling there. Also Read about “The Children of Mu” by Churchward. Wander around the Nullarbor and you will be surprised at the amount of seashells you can find. Interesting that gold was valued then as now. Not surprising that Ozz traded with the world -why do we think that nothing happened in it before Captain Cook? The climate must have been more comfortable for the city to thrive and survive. The Sahara was once green. Things change. Any evidence of pack animals? maybe there were rivers in those days. Life starts with water and when exhausted becomes desert. 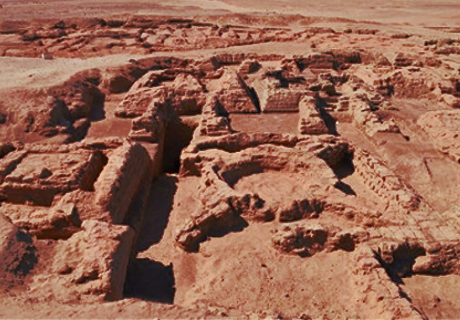 Chaco Canyon, New Mexico, appears to be a major trading site without a port. There used to be a sea inland of Australia, as sea shells can still be found there, so this city was probably a coastal city, maybe of the Lemuria civilization? What have the “discoverers” been drinking? yeah, but try telling them that! Read “The Shadow out of Time” by H.P.Lovecraft, and then run like hell!